Credit standards on loan applications for construction and land development loans or credit lines tightened, on net, over the third quarter of 2015. According to the most recent iteration of the Federal Reserve Board’s Senior Loan Officer Opinion Survey, a net share of 4.4% said that lending standards at their respective commercial bank tightened. The net share represents the difference between the share of survey respondents that said lending standards at their respective bank had eased and the portion of respondents mentioning that lending standards at their bank had tightened. As illustrated in Figure 1 below, 7.2% of senior bank officers said that lending standards on construction and land development loans had eased, but 11.6% mentioned that standards on these loans had tightened. Lending standards tightened at both large banks and other banks. However, the proportion of respondents mentioning that standards had tightened, on net, was greater at other banks than at large banks. According to the Senior Loan Officer Opinion Survey, large banks represent the largest national banks while other banks represent smaller, regional banks. 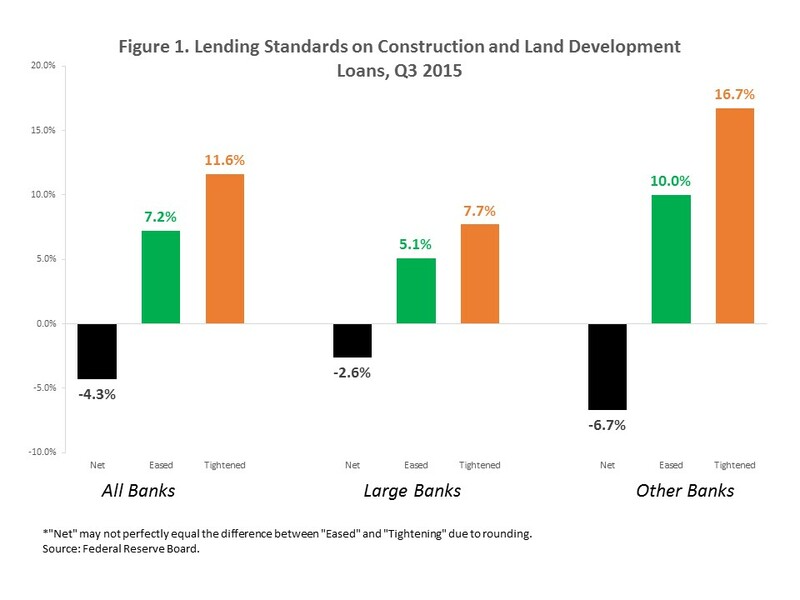 As shown in Figure 1, lending standards on construction and land development loans at large national banks tightened by 2.6% on net as 5.1% of respondents said standards had eased and 7.7% mentioned that standards had tightened. Meanwhile, lending standards at other banks tightened by 6.7% as 10.0% of senior officers at other banks mentioned that standards had eased, while 16.7% said standards had tightened. A previous post demonstrated that while the 20 largest banks, as measured by the total dollar value of loans and leases, hold the majority of single-family first-lien mortgages, these banks hold a minority of construction and land development loans. The minority stake of construction and land development loans outstanding held by the 20 largest banks has endured over the entire period for which data is available, 2001 to the second quarter of 2015. While the share of all construction and land development loans held by the 20 largest banks returned to its 2008 level by the end of 2013, the share of the components of construction and land development loans, 1-4 family construction loans and other construction and land development loans, held by the Top 20 banks has changed. As shown in Figure 2 above, the 20 largest banks accounted for 31% of construction and land development loans in 2001. All other banks held the rest, 69%. After some fluctuation, the share of construction and land development loans held by the 20 largest banks rose by 2 percentage points to 33% by 2008. The share of construction and land development loans held by the 20 largest banks rose to 38% in 2009 before beginning its descent. By 2013, the 20 largest banks held 33% of construction and land development loans, its share in 2008, where it has stabilized. Part of the reason why the share of construction and land development loans held by the 20 largest banks fell between 2009 and 2013 is because its portion of 1-4 family construction loans outstanding shrank relative to the proportion held by all other banks. As shown in Figure 3 above, the extent of the decline in larger bank holdings of 1-4 family construction loans was comparatively steep. In 2009, the Top 20 banks accounted for 34% of 1-4 family construction loans and all other banks accounted for the rest, but by 2013, the share of 1-4 family construction loans outstanding held by the Top 20 banks shrank 16 percentage points to 18%. By 2014, the share of 1-4 family construction loans held by the 20 largest banks was half of its 2009 level. 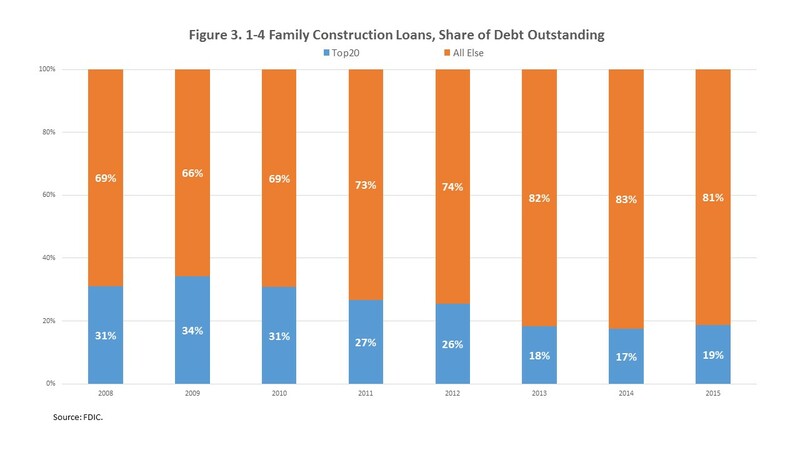 Over the first two quarters of 2015, the share of 1-4 family construction loans outstanding held by the 20 largest banks has ticked up to 19%, but, despite nine consecutive quarterly increases in the overall level of 1-4 family construction loans outstanding, the share held by the largest 20 banks remains depressed relative to its 2008 level. Similarly, the share of other construction and land development loans held by larger banks also declined between 2009 and 2013, but the decrease was not nearly as great. 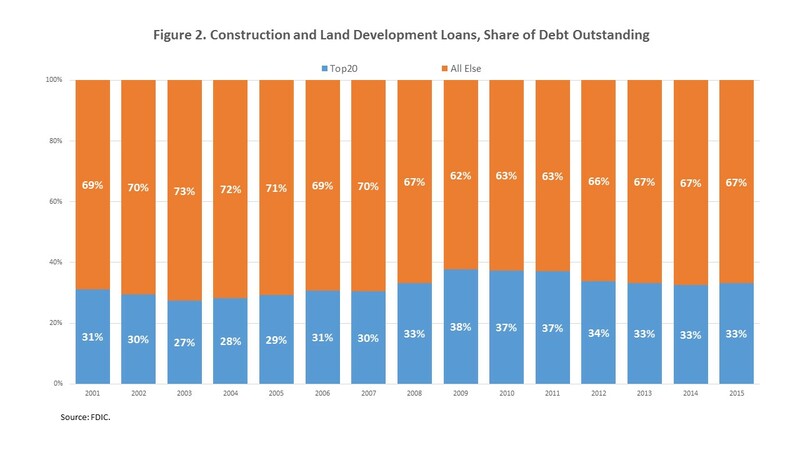 Figure 4 above shows that, after peaking at 39% in 2009 and holding steady at that percentage level until 2011, the share of other construction and land development loans held by the Top 20 largest banks dipped to 36% in 2012, but rose to 37% in 2013. At 37%, the level it has stabilized at since 2013, the share of other construction and land development loans held by the 20 largest banks remains above the percentage level recorded in 2008. I’m confused by the text and figure 1 in this article. It appears they conflict, can you clarify? IE: “as 5.1% of respondents said standards had eased and 7.7% mentioned that standards had tightened”. The figure seems to say the opposite. Good catch. The labels are switched. We’re posting a fix soon. Thank you, that helps make it much more clear.